Twice a week, Making A Mark gives an insanely talented artist some IADW brag-space. Today, I'm continuing to spotlight some of my personal hit-pick-pro's with Carlos D'Anda. More than that Arkham Asylum guy, I first found his art through the illegally oversized talent pool that was Wildstorm Studios. Kicking things off, his take on a character created by the ultimate one man talent pool, Jack Kirby. More then an imposing figure, Darkseid captures what I love about Carlos's figures - they have a solid weight to them. They feel 3-dimensional. And while the Lord of Apokolips is more Kirby-esque in detail, he's pretty good at that too. Deathblow opposite, was where I ran into Carlos. 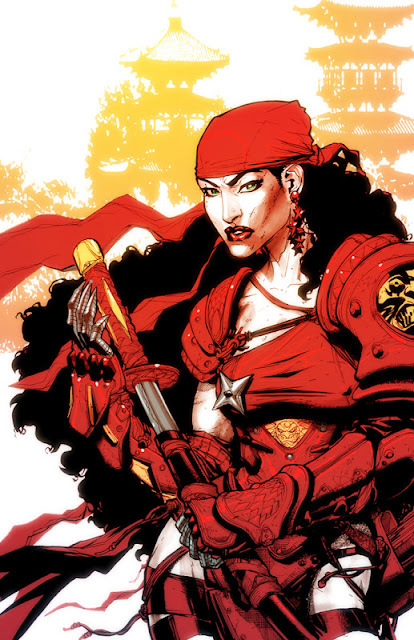 This image of Wildstorm's main mercenary brings the detail mentioned above to the fore. Not only does the contrast of the bloody blades make the image pop, they mirror the stripes on DB's face! 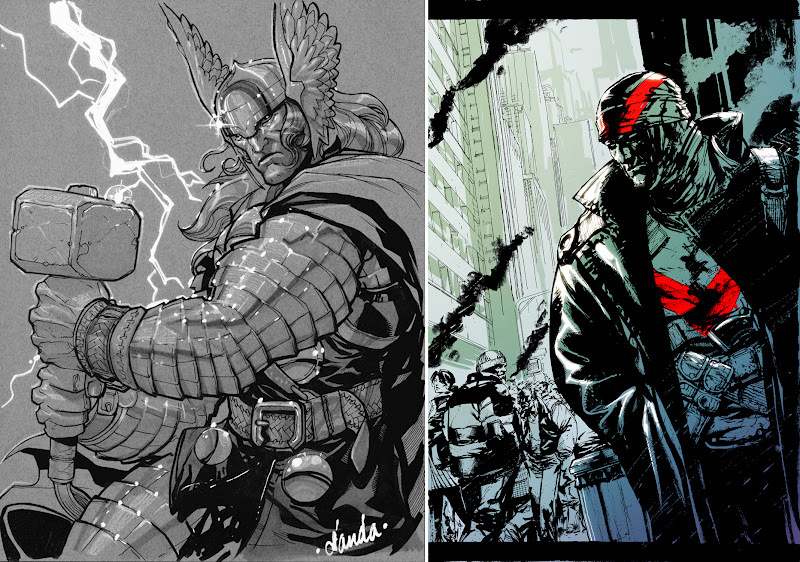 Inspired by artist Oliver Coipel's beyond 'redefining' run on Thor, the Thunder God actually looks the size of an Asgardian warrior - just check out that hammer! The piece to the left, a character sketch for an unused treatment on DC's Vigilante concept, based off an idea by writer Rick Veitch. I don't know about you, but I wanna read it off this sketch alone! Hey look folks, Elektra can wear more clothes and still look lethally hot (and probably a bit more practical too)! What do you think? Sound off below in the comments section or click here for more great Making A Markists. To see Carlos's jaw-dropping artwork in full, visit his website after the jump. Yeah Carlos has come a helluva long way from his early Wildstorm days. He's gotten a little more realistic with his art style, yet it still retains the right amount of cartoon/anime influences. 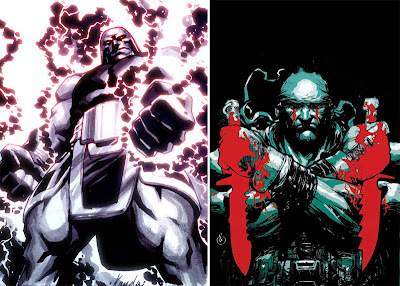 Love the Darkseid and Thor one too, as well as Deathblow, and my god, the detail on Elektra! Glad Carlos is a hit with you too Dale - it's interesting watching an artist grow o the page isn't it? As for Elektra, I dug that so much, I've put it on my mobile phone..
Now that's a point too Craig! Sometimes Elektra does look like she is from a different ethnicity doesn't she. Not here though!